We are thinking about heading over to SFNE (along with some other parks) and taking a coaster friend that is 6'9". Many of their adult rides have pretty ridicules maximum heights some as low as 72". Bizarro is 76", Goliath 75", GCGEAA 75", Mind Eraser 78", Jokers Wildcard 72", Tomahack 77" & Twister at 77". Many of these he has ridden at other parks without any issues or restrictions. Do they actually check and enforce max heights? Is this due to some strange Mass law? Any clue as to why this park doesn't like tall people? Dave, while I don't work in the industry any more I can say my experience in the industry has been there typically isn't an "official" measuring instrument to tell when someone is TOO tall. Ride operation manuals do have minimum and maximum info for ride operators to follow but if you don't have a measuring tool it really boils down to subjectivity, such as an over-the-head shoulder restraint not locking because a guest is too tall or, such as on Bizarro, if said guest's head and shoulders fall far above the head restraint. 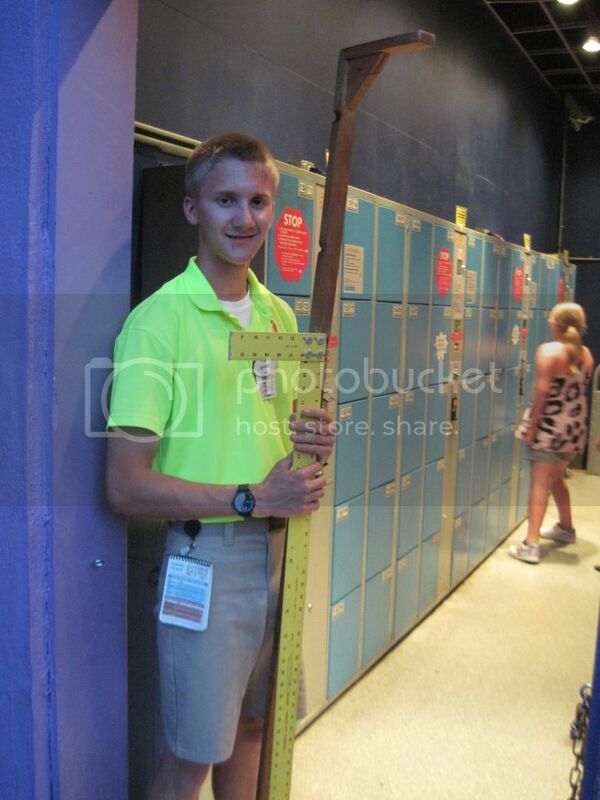 I know this isn't much help, maybe someone currently working at Six Flags will respond if they do indeed have instruments now for measuring max height. I'm guessing the mouse and top spin height limits are from the manufacturer since Dorney's mouse is the same model and has the same height limit (and Dorney also added this year that you have to be 8 years old to ride if you meet the height requirement). Both Great Adventure and Dorney also have the same height limit for their top spins. The restraints on a top spin won't close properly if you're too tall. Can't help you with any of the other rides. Over compensating for their own physical inadequacies in other areas. I have ridden with him on a number of Mice (including Dorney's) and Top Spins without issue, so while the restraint issue is probably true, in his case it wouldn't be a problem. When we were at SFA on Monday they told him that he may not fit under the lapbar, but to try a back row of the car. He was fine and was able to ride. I can understand on a ride like wicked twister where long legs can make contact with the ground while riding. Just like how I have ridden every impulse coaster in the country, but have never even come close to riding WT at Cedar Point. Try to figure that one out. Long legs on an inverted coaster will shorten the rider by the final brake run. We have a guide to measure maximun size, and it is mounted on the front car in the spring. Like a 'cow catcher' on the front of an old steam train engine. Dangling legs will get broken, and have happened in the past. You just haven't heard about it. Many, many years ago in the first or second season of the Mind Eraser when SFNE was still Riverside, there was actually a max hight stick on the ride. I never once saw it actually used, but it was there and we were trained to enforce whatever the height cap was for the ride. In many years of working on rides, if someone was too tall to ride the restraint wouldn't close properly. It's unfortunate but your friend's comfort level would probably trump any height cap be it enforced or not. I'm 6'3 and really can't handle the Intamin drop tower rides at some parks and don't even bother with them anymore. I can get the restraint closed with some help, but it crushes my shoulders way too much and also causes some back strain. The discomfort outweighs the fun of the ride so it's just not worth it for me. I've seen them check at GCG and Bizarro whenever I go they just have tall wood stick that the team member checking minimum height holds also. I guess you could get lucky though, they usually have them at the station entrance or in Bizarro's case at the entrance to the queue by the lockers.